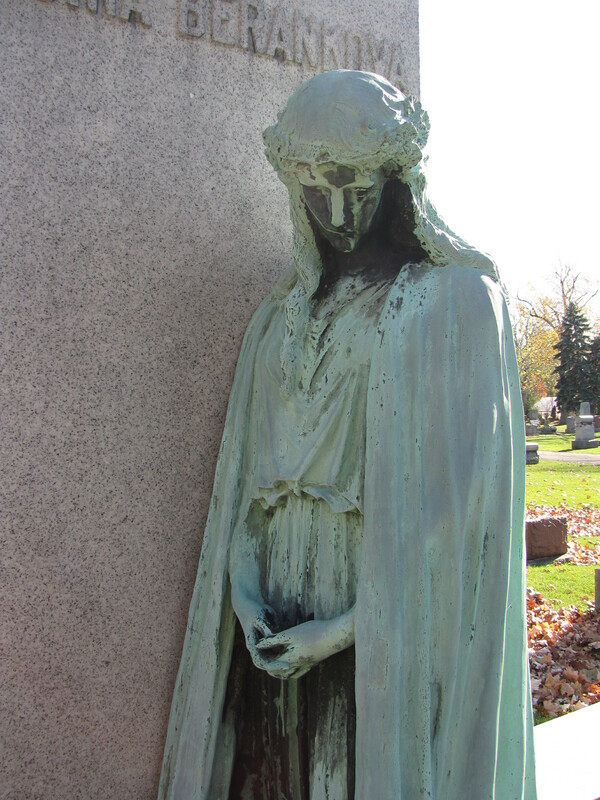 Mario Joseph Korbel (March 22, 1882 – March 31, 1954) was a noted Czech-American sculptor who worked on several commissions for monuments that are found in cemeteries in Illinois and Iowa. Like many artists, including Daniel Chester French, Aldabert Volck, Felix Weihs de Weldon, Karl Bitter, Martin Milmore, Alexander Milne Calder, T. M. Brady, Augustus Saint-Gaudens, Albin Polasek, Harriet Whitney Frishmuth, Edwin Blashfield, Edward V. Valentine, Sally James Farnham, and others, Korbel was able to earn his living creating sculptures, public and private. Korbel was born at Osik, Bohemia, the son of a clergyman. At the age of 18 he immigrated to the United States where he continued his art studies. Korbel also studied sculpture in Paris at the Julian Academie and at the Royal Academy at Berlin. In 1909, Korbel opened a studio in Chicago. 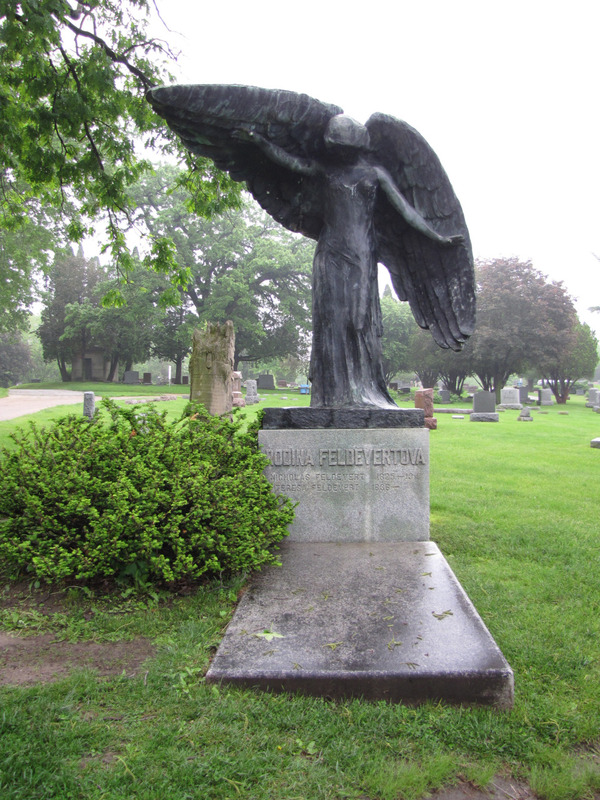 The first Korbel monument I became aware of was the famous Black Angel of Iowa City, Iowa. Diana Brace, a friend who graduated from Iowa University had known about the statue and related some of the stories surrounding it. The commission is to be found in the Oakland Cemetery at Iowa City. This statue has become famous locally for the stories that have sprung up surrounding the memorial. Local lore has it that this black angel has a dark story which probably began to swirl when the bright bronze statue turned black. Instead of oxidation being the reason for the color change, rumors began to emerge about the “mysterious” woman buried beneath the angel. Teresa Dolezal and her son, Eddie, emigrated from Bohemia to America where she continued her practice as a midwife. Eddie died at the age of 18 with meningitis and was buried underneath a tree-stump gravestone in the Oakland Cemetery. After her son’s death, Teresa moved to Eugene, Oregon, where she met and married Nicholas Feldevert. Not long after their marriage, Nicholas died. Teresa moved back to Iowa City. 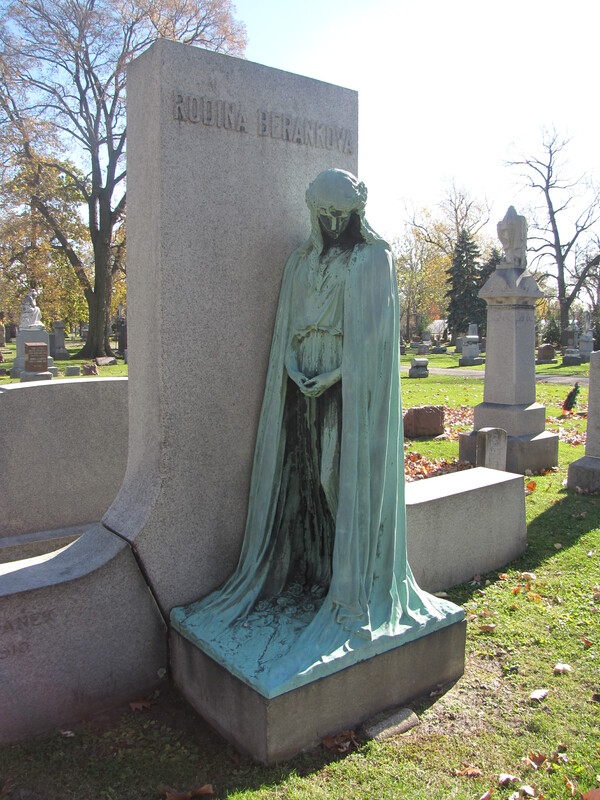 Teresa hired Bohemian artist, Mario Korbel, of Chicago, to create an angel for her husband’s grave. She also gave instructions that the angel was to hover over the body of her son’s grave, too. Korbel created the angel with one wing spread open over Eddie’s grave. Teresa died in 1924 and her ashes were placed underneath the grave ledger next to her husband’s remains. No one remembers for sure when the angel turned color but that is when the rumors started. The stories about the reasons why range from fanciful to evil and suggest that the color change was due to the nature of the woman buried beneath the angel. One story goes that on the dark and stormy night of Teresa’s burial a lightning bolt struck the angel and turned it black instantly. Another rumor suggests that the angel itself portends of the evil—most graveyard angels, they say, look upward with their wings lifted toward Heaven, but this one looks downward. Ominous. 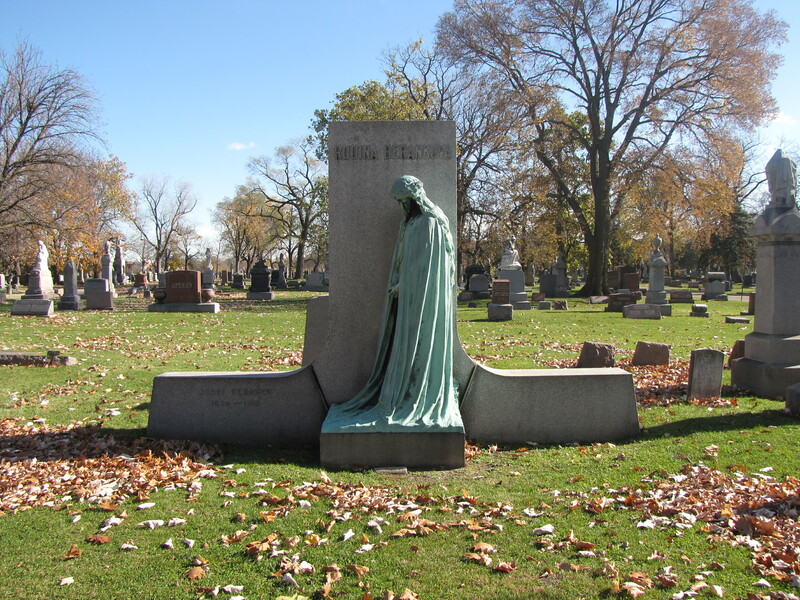 The second commission is in the Bohemian National Cemetery at Chicago, Illinois. 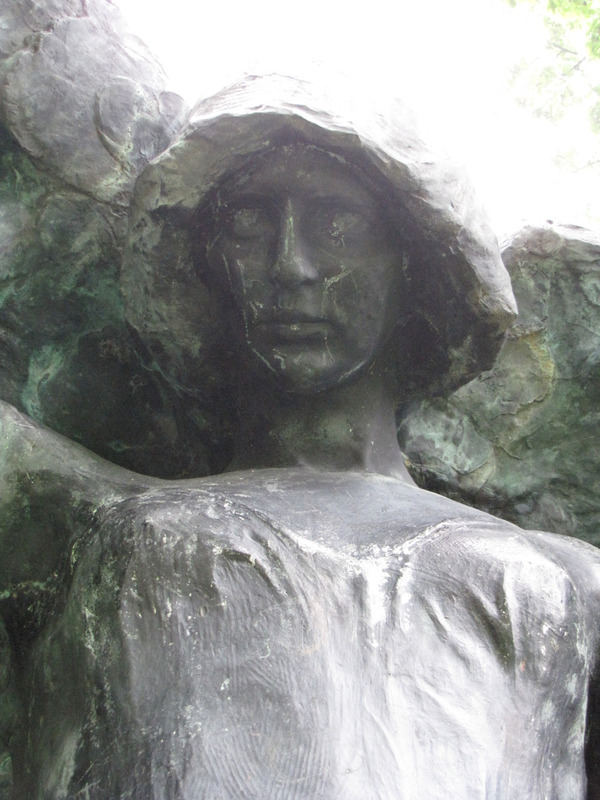 A bronze statue was commissioned in 1910 by Emanuel Beranek upon the death of his father, Josef Beranek. 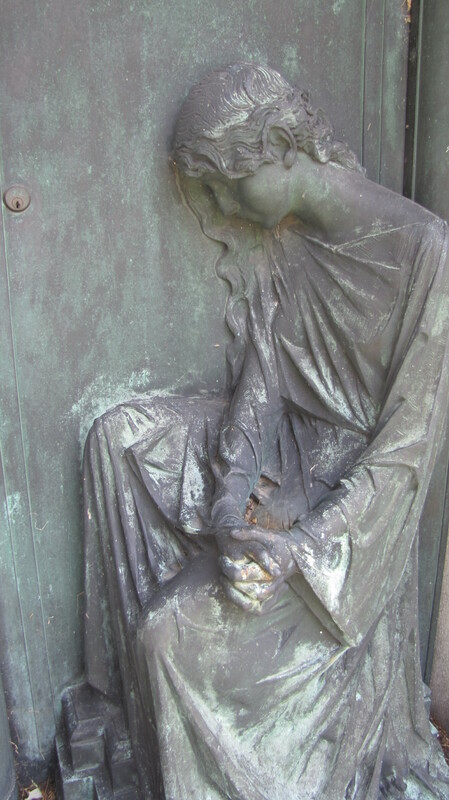 The mourning figure that Korbel sculpted is titled Resignation. The cloaked woman looks downward, holding her clasping hands together in meditation. The third commission I found by chance. I was walking around the Rose Hill Cemetery at Chicago, Illinois. 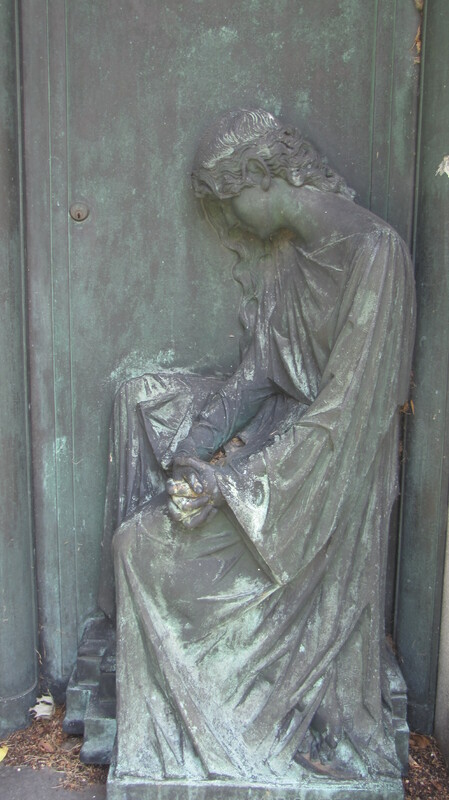 I took a closer look at the door on the Louis M. Stumer mausoleum which depicts a seated mourning figure. Mario Korbel’s name was carved at the bottom of the door. Fascinating story! I love those “green” angels but this black one is indeed a curiosity! Love the family background stories behind them….I like the asmymetrical wings! I am researching Mario Korbel and his wife Hilda. Cannot find anything after their marriage in 1917. I do know they had one child. Any help? I am sorry to say that I don’t know much about his personal life. By now I would bet you have found more information about my step-grandfather, Mario Korbel. Mario and Hilda had one son, John, who died June 10, 2004. If you would like to contact me, my email address is marc.fleisher@gmail.com. Wanted to say thank you for the information on Mario Korbel. Would you know how much the commission was for the black angel? I found my answer this link gives excellent information on the statue. 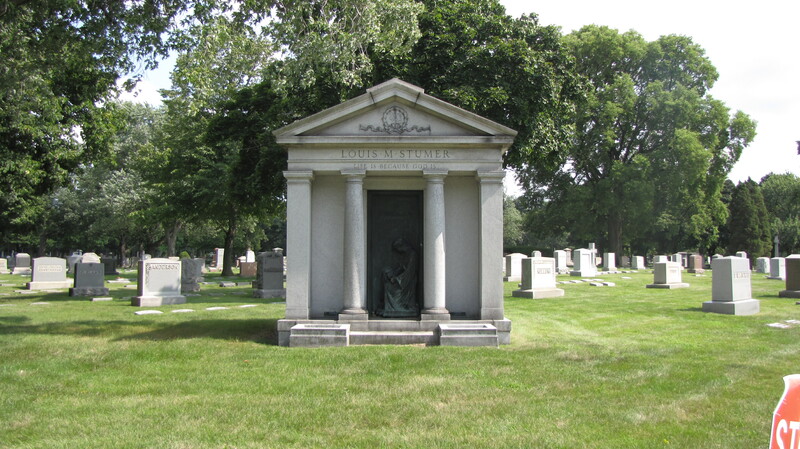 The Stumer mausoleum is located near the western edge of Rosehill Cemetery in Chicago, not Forest Home as stated in the posting. Thank you for noticing my error. I have corrected the text.